Developed to improve all soil types! EBS Soil Stabilizer is the most advanced product available globally developed by Soil Solutions®; Engineered Base Stabilizer – EBS is a Nano Co-Polymer that has an extended branched molecular structure that creates a multi-dimensional matrix that binds the soil particles allowing for significantly increased strength of the in-situ soil. 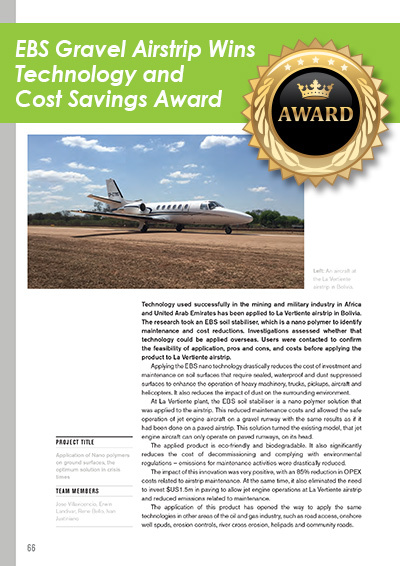 EBS is used to stabilize in-situ material as a cost effective alternative to traditional method of imported aggregate or cement. EBS is used to surface seal gravel roads to provide a water resistant surface that provides complete erosion control and protection from any material loss. The amount required is determined by the soil indicators and will be advised by a qualified and trained Soil Solutions representative. ONE Application of EBS Surface Seal will protect the stabilized surface from loss of fine material, provide effective dust and erosion control depending on application rate and traffic. Most importantly this road surface will never require grading or watering, providing a sustainable solution and significantly reduced maintenance delivering Reduced Costs & Benefits. An EBS Surface Seal provides a dust free road surface which is water proof, flexible pavement that has a high load bearing capacity that is skid resistant. A road or airstrip that has a EBS Surface Seal will have a Hard All-Weather Surface that will prevent erosion, material loss, and pothole formation. Surface that will prevent erosion, material loss, and pothole formation. 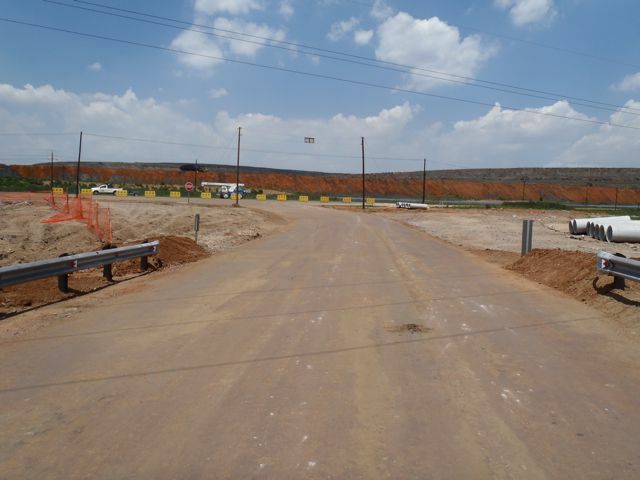 When EBS is sprayed on loose material such as: Road shoulders, Mine Tailings, Sand; Stockpiles, it is an effective method for dust and erosion control. The advanced and highly concentrated formula of EBS ensures the best results and that there is no parallel in the market. Soil Solutions… Consider It Solved. Why Soil Solutions ? 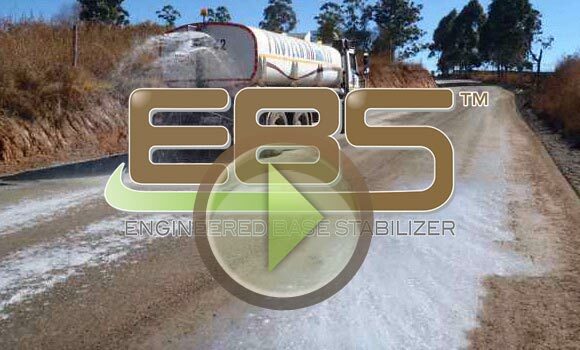 Why EBS – Engineered Base Stabilizer ? Case Studies, Independent Laboratory and on-site testing have time and time again has proven that EBS, a fit-for-purpose product, out performs all other products in the industry. Superior results of EBS are due to our custom formulation and consistent quality combined with our advanced application methodologies. Soil Solutions has a Proven Track Record – Proven Performance – Case Studies – Independent Laboratory Results. EBS is an important component of our Intelligent Road Solutions together with Recycler Attachments and GeoGrid technology. This combination of technologies allows Soil Solutions to develop a specifically tailored solution for every client and every project. is it a by product or waste product of another industry ? Does the product delivered match previous samples provided ? How often should it be applied ? Does the supplier have independent third party test results from registered laboratory as to performance ? Does the supplier simply sell the product with instructions or do they walk with you each step of the project ? Where has this product been used before ? Does the supplier have actual project references and documented Case Studies ? How long has the supplier been in the market ? What type of site, engineering, product knowledge does the Supplier have ? Will the supplier conduct a Site assessment to determine your exact needs and a specifically tailored solution ? Will an Application methodology be provided that is project and site specific to your needs, weather patterns and environment ? Will on site assistance and training for the application be provided ?